Wow! Am I ever impressed with this product! In my experience, suction bowls have been a total and complete waste of my money. They work for 3.5 seconds before the suction releases and bowl is victoriously tossed to the floor, or simply as far as possible. 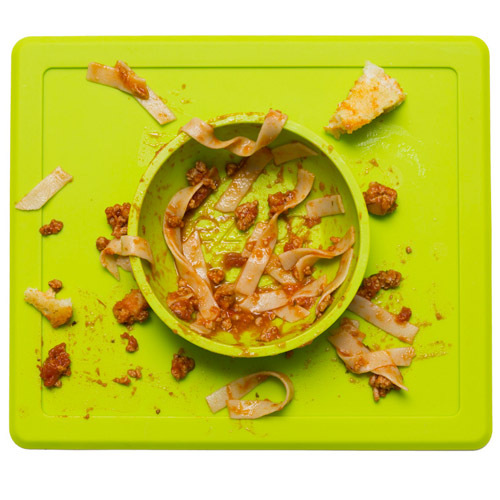 I am a firm believer in touching food and making a big ol’ mess to learn how to eat sometimes the disaster is just a little much. The game of “I toss and Mama picks up” also gets old really, really quickly. 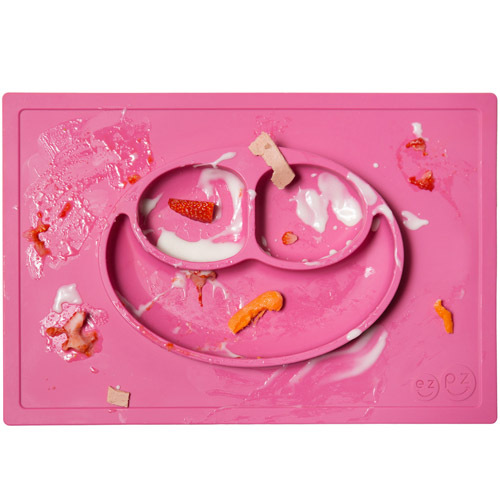 This little number is a placemat and a dish all in one! The suction is unbelievable. The only way my little one has figured out how to move it, is to peel up one of the corners. Otherwise, it has stayed in place FOR THE ENTIRE MEAL. ON MULTIPLE OCCASIONS!!! Pros: great suction, comes in a divided plate version or bowl version, easily fits in the dishwasher and is big so it catches a lot of mess. Cons: Cost. It is expensive. It may not fit on the tray of a highchair because it is meant to be used at a table. Takes ++ surface area to store flat. It’s big. Available at West Coast Kids for $29.99. The bowl version is $23.99. Let me know what you think if you try it. Menu planning always makes my life easier. Coming up with the ideas and actually doing it is the tough part. 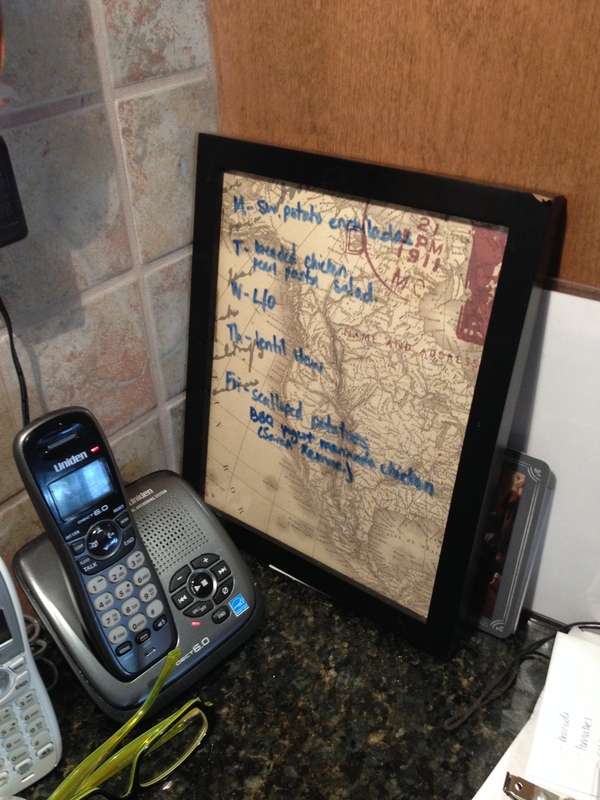 I’ve recently started following Sarah Remmer’s work (RD) and really enjoyed this post! Menu plan and recipes! Even my 2 year old is starting to have an opinion over what should be included in our weekly menu. I aim to menu plan before grocery day (doesn’t always happen!) and our week goes much smoother. Having a menu plan truly does make the witching hours much easier to deal with. Figuring out what to make for dinner, and making it while holding a needy baby or negotiating with a 2 year old who quickly escalates from a whiny voice to death-kon-3 tantrums is something I like to avoid. I’m trying to include my 2 & 4 year olds in the menu planning process (ahem…when I’m at the top of my game). They will volunteer one thing they would like included in our week’s meals (and it has to qualify as a “healthy” choice). They seem to like knowing what is coming at them for meals in the near future. I came across an infant activity calendar today! Daily activity suggestions, as well as monthly parenting tips, rhymes and recipes. Aimed at 0 – 18 months. Find the toddler version (18 months – 3 years old) here. I recently came across this new product and totally love it! In my opinion, it’s far superior to the mesh feeder bags. 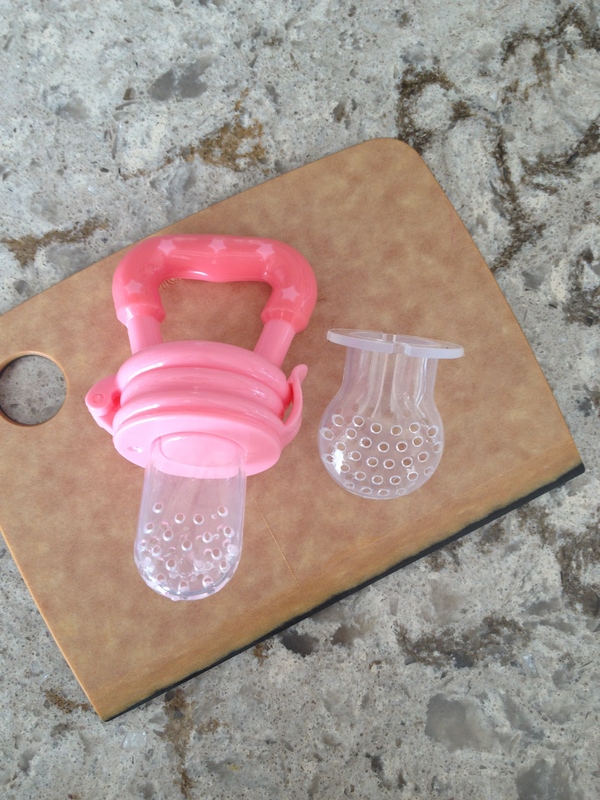 This tool is an alternative to the mesh bags for babies who are early in their eating careers. 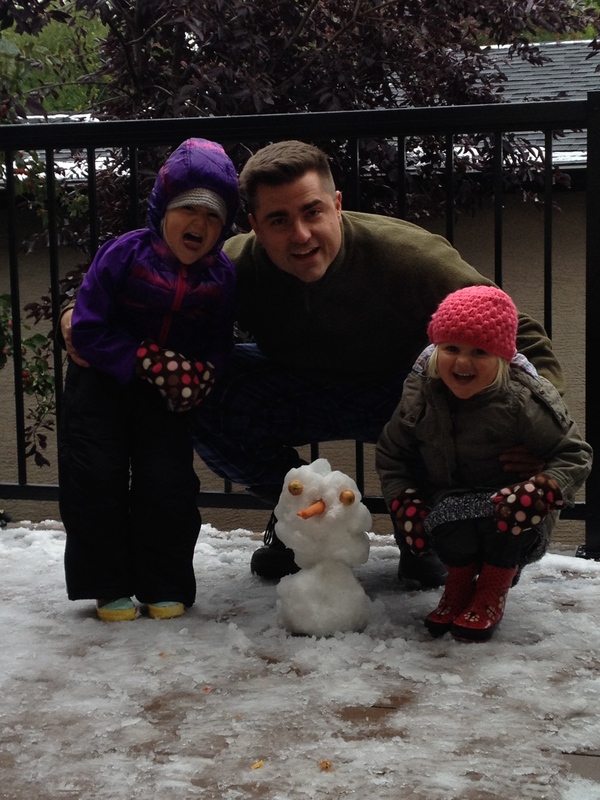 Made by “Baby Cubes” and carried locally by Kacz Kids and West Coast Kids. I love that it has two sizes of inserts, a narrower one with slightly smaller holes for early on, and the wider one for later. You can put fresh fruit for your babe to munch on without the worry that she will get a big piece off. I love it with watermelon, berries and even pieces of BBQ’d chicken. Great for tasting new things, munching, and practicing hand to mouth. I also love that it is easy to clean. I detest the wet mesh bag you are left with after washing. I once found mould at the seam when I went to use it… into the garbage it went. Check it out and let me know what you think! Our days are somewhat chaotic of late. Soloing three kids, ages three and under is a game changer. Let’s just say I aim to shower every second day. To survive, I’ve been trying to create opportunities for my big girls (2 & 3yo) to be independent. They are kind of short and not terribly coordinated so I need to scaffold tasks for them. I try to prep all the steps that could cause an independence failure. I want them to be successful with tasks on their own; I love the proud exclamation “Mama, look!” after they’ve done something on their own. More importantly, I want them to peacefully do things together! Frustration tolerance is at an all time low for my little people. My 2 year old has the tendency to lose her marbles at the drop of a hat so things need to be more than straight forward. Loosing her marbles = scream crying to the tempo of her trembling, angry muscles. Frequently, the muscle contractions lead to jumping as high as she can to stomp the floor. You got it, all these actions happen while she screams. The concurrent flying, wild blonde hair is quite a sight. Needless to say, it’s not the easiest situation to deal with when I am nursing the littlest. 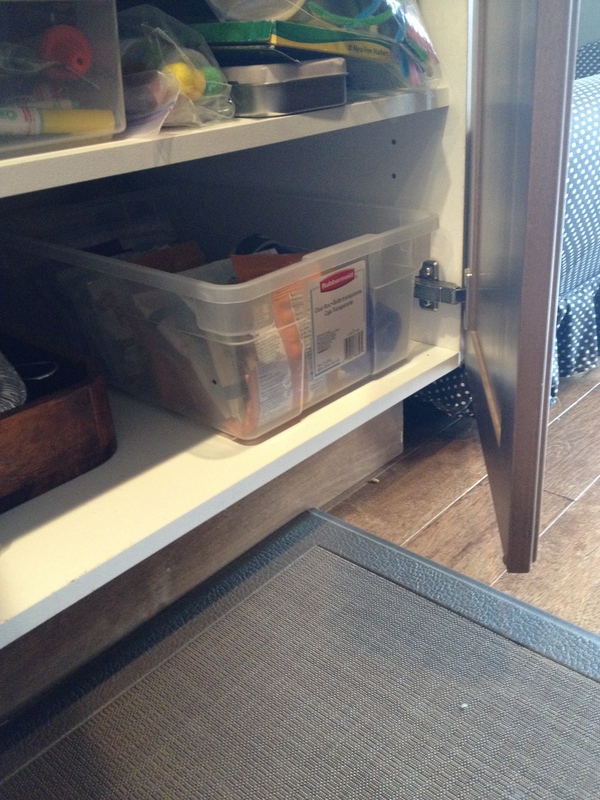 Voila : A kids only snack cupboard stocked with food and tools to get into the food. Snack time has been challenging lately. I either forget to put one out until it is almost supper OR we just plain haven’t fit it in. Tantrums and meltdowns are always THE WORST when basic needs haven’t been met. If my kids have a topped up sleep tank, a full belly and an empty colon, we are golden ….. most of the time. I can also supervise from the living room while they choose and prep their snack, not to mention the added bonus of improved snack consumption. I’ve placed a small rubbermaid bin in one of my low kitchen cabinets and filled it with bowls, cups/water bottles, snacks and scissors. I’ve started with store bought snacks like Annie’s bunny crackers, the Costco Preventia heart cookies, fig bars, crunchy snap peas and apples. They like to use their scissors to cut open the bags. I plan to add more homemade goods as soon as I get a little more sleep. Likely something like fruit leather, muffins, cheese spinach crackers etc. I might even go so far as getting a small jar of peanut butter and adding some spoons or a butter knife. So far, we’ve had good success. The girls like to pick their snack and put it in my bag when we get ready for an outing. They will also grab a snack on their own in the afternoon. The 3 year old can fill a cup with water from the fridge dispenser and the 2 year old is competitive enough to get a stool to do the same. I figure water all over the floor is a small risk to take. Although, god help me if they both want to stand on the stool at the same time. Let me know if you’ve got other independence ideas that I can try out! Community Education Services through AHS at the Children’s Hospital start up again in January. I noticed a couple of Infant Sign Language courses being offered. Check out the calendar for details. All sessions are free of charge. I always thought I would be a “crafty” kind of mom. I am an OT for goodness sakes. Pinterest worthy crafts do not exist at my house and my craft cupboard is embarrassingly disorganized. I can’t ever seem to remember to get the craft-specific supplies on my grocery runs. Seems like success enough if I manage to remember most of the foods I wanted for the week AND didn’t have to haul anyone out screaming on my hip. It’s normal to have kids leave Superstore looking like they just bathed in the free chocolate cookie residue right?! I do happen to have a 3 year old who enjoys coloring, painting, cutting and general crafty/preschool readiness type things. I don’t always have great ideas but I try my best to give her an opportunity to do those things most days. 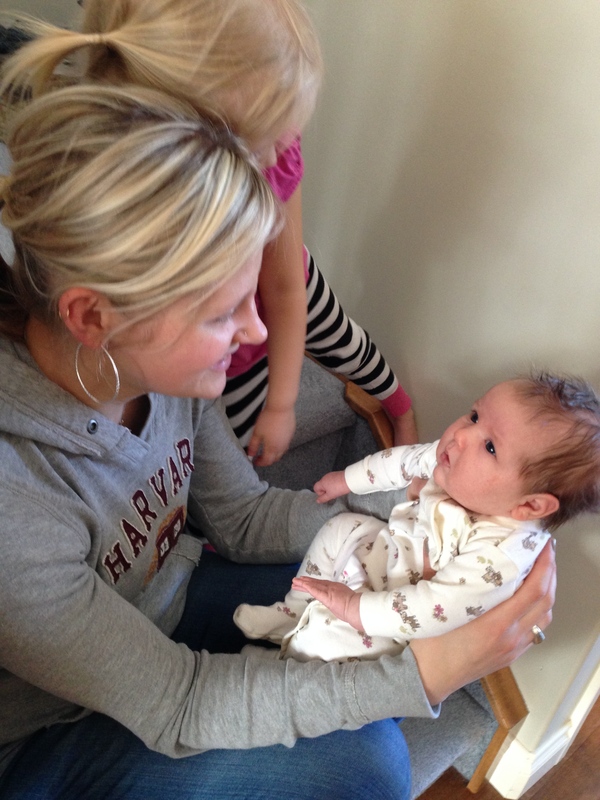 Mama OT is a great blog that suggested a resource called Productive Parenting. It is a site that will send you age appropriate activity ideas on a frequency that you can determine! I am trying out the weekly version…. will let you know how it goes. Even if it just helps to give me some new ideas for quiet activities. I need activities that the girls can do quietly on their own so I can do whatever needs to be done without 2 chaos creators by my side. I have been lacking on the playdoh time lately and was re-inspired after seeing a few new ideas of what they can do with it (stack Cheerios on toothpicks stuck into the playdough, stick raw spaghetti into it and stack penne pasta or cheerios, or stick small mr. potato head pieces in it to make faces). They were quietly consumed for half an hour with minimal referee-ing necessary. It was a good reminder that those kinds of sensory activities are really calming for my kids. I know, I’m a peds OT and I so easily forget these strategies with my own kids. The learning continues….. I was just gifted the Weelicious cookbook and WOW! I have so many stickies ready to go I don’t know where to start. I was feeling stagnant in the snack department so I tried the Date Nut Bites. It was a relatively easy prep that both girls could “help” with AND half the batch was gobbled up as I was rolling the balls in coconut. It’s a great finger food as it is pretty soft. You could be sure to grind the walnuts extra fine and leave out rolling it in coconut for those more texture sensitive kiddos. Puree dates and walnuts in a food processor until smooth. I did these separately with my Bamix, then mixed with a spatula in a bowl. It suggested to roll a tsp of the mixture into your hand and then coat with the coconut. I found it a bit sticky for this method. 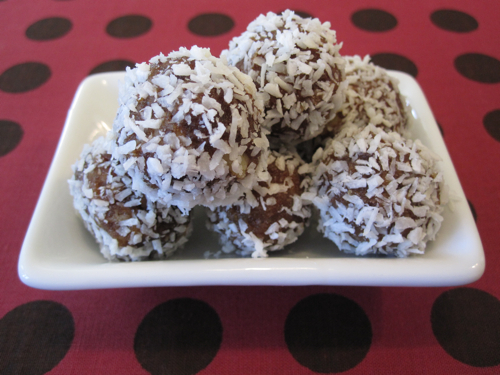 I dumped a tsp or less of the mixture right onto a plate of coconut and then rolled into a ball. Delicious! They were even better frozen! I am not a dentist or a dental hygenist but I understand the importance of oral hygiene and the great opportunity it can provide for developing oral-sensory-motor skills! 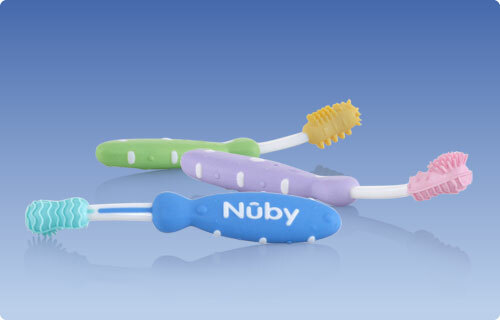 It is necessary to wipe a baby’s gums before he even has teeth. 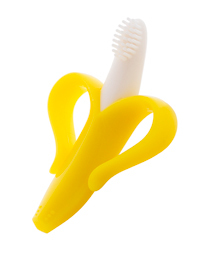 The Canadian Dental Association recommends a soft finger brush or a soft cloth on your finger to wipe the gums. Once babies are a little older, they can grasp and mouth toys. 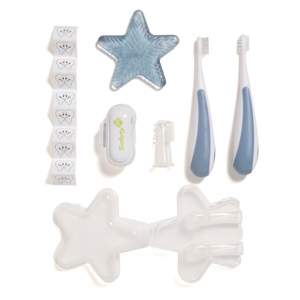 There are all kinds of tools marketed for oral hygiene but are also great tools for developing the skills to learn to eat. 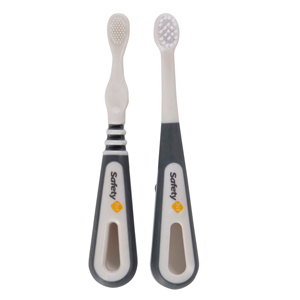 Experience with these tools can provide the opportunity for the mouth to become comfortable with different textures, for the tongue to learn to move separately from the jaw, and for the gag reflex to move towards the back of the mouth. Particularly, the stick shape is different from the majority of rounded toys that babies play with. Rounded toys don’t move past the front gums and tip of the tongue. More frequent gagging is definitely a risk with stick shaped tools, especially when the baby doesn’t quite yet understand that pulling out the toy will stop the gagging. Some of the tools listed below come with a “gag guard” to prevent exactly this. Let me know if there is any other tool you’ve fallen in love with.